Very Neat, Clean, Conversational, Measurable, and Sober. This Sample-Bartender-Resume will hit on your following qualities...1) You are Experienced; 2) You are Knowledgeable; 3) You are SAFEty conscious; 4) You can be Trusted!!! "Can you come to my office for an interview 'round Three O'clock?" When referencing your free sample bartender resume or job application, speak about your experience and strengths while mixing up a White Russian behind the bar. Work well in a high pressure environment. Trained and managed 15 employees for food, beverage, and maintenance operations. Bar Staff achieved significant improvements in order-to-service productivity. Drove Monthly Beverage Gross Revenues by 20% within a 90 day period. Excelled at directing staff in the successful attainment of Food order cross-selling to Beverage Patrons. Proven record of working within Annual budgets. Over 7 years experience in OLCC cataloging and Micros POS. More than 3 years hands-on experience in State Alcohol Beverage control staff education training. Demonstrated accuracy, attention to detail and ability to work well in team environment. Adept at both oral and written communication. Interact effectively with individuals of all levels. Expert with Viral (word-of-mouth) and Coupon Marketing Campaigns. Exercise initiative, achievement and independent judgment to safely drive Alcohol beverage sales. Bartender, March 02, 2002 to Present. Executed daily operations of Inventory Set-up, Checklist review, and Station cleanliness. Arranged bottles and glasses to make attractive displays. Created drink recipes on behalf of High-Roller, Taste-Discriminating Clientele. Planned, organized, and controlled the operations of a cocktail lounge and bar. Checked identification of customers in order to verify age requirements for purchase of alcohol. Balanced cash receipts every 4 hours. Licensed Bartender, Bar Owner, Entrepreneur, Best-Selling Author, and Mixologist, Jeremy Sherk, has just introduced a new online information product for Bartender wannabees. It's called, "Bartender Secrets Exposed!" But before I tell you more about Bartender Secrets Exposed, Jeremy wants to give you some free job interview tips that he's learned over the years through experience and as a Graduate of the University of Hard Knocks. Your mouth is dry, your palms are sweaty, your heart is beating so fast it feels like it's going to pop out of your chest! Even though you've made an awesome sample bartender resume copy. A.A.S., Accounting & Business Administration, 2001. Trained in all areas of Cardio Pulmonary Resusitation. Thorough understanding of Blood-Alcohol content mixology. Expert in Quickbooks and Peachtree Accounting Software. References: Professional references available upon request. Pongo's business philosophy is "Get Organized and Get Hired!" That's why preparing a sample bartender resume and sending it to employers can be a challenging task unto itself. Following up on those submissions adds yet more time-consuming work, especially if you're sending several resumes at about the same time. That's why it helps to become organized if you put your job search in high gear. Pongo Resume Service has helped THOUSANDS of job seekers and career changers. Two of their testimonial successes are from Michael and Ken. Thanks for your amazing product. I have over 6 years experience in my profession. After several months of trying to get a job within the profession without success, I came across your product. 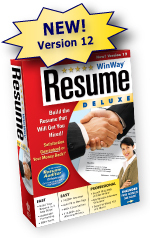 Last yet not least of eResumes4Vips' How to Make a Resume resource endorsements is the Winway Resume Deluxe v12. WinWay's Resume Wizard takes the guess-work out of how to make a resume in seconds. Simply choose a profession and fill-in the blanks. Don't start your resume from scratch. Simply enter the job title and let the new Resume Wizard find the closest matches from over 14,000 resume examples. Go through the wizard steps and fill-in the blanks. Watch your how to make a resume coming to life in front of your very eyes. Customize your resume further by adding specific information about your experience and skills. Winway Resume Deluxe v12 solves your write a resume how plus generates cover letters automatically...also auditing them for errors.